In July 2017 Paul and Helen spent two weeks in The Picos de Europa and surrounding areas with Paul's parents and his nephew, a budding wildlife photographer. Over 100 species of butterflies were encountered on this trip and 94 of these were captured on film and are included on this DVD. This twin DVD set also includes footage of the spectacular mountain scenery and much of the other wildlife encountered, including flowers, dragonflies, moths and birds such as Alpine Accentor and Wallcreeper. After visiting the Pyrenees as a teenager and Extremadura some years ago we decided to visit The Picos de Europa, an area renowned for butterflies and interesting mountain birds and plants. We planned our visit to coincide with the highest emergence of butterflies and arranged a day out with Teresa Farino, a local wildlife expert. Teresa has a great knowledge of the local area and all the wildlife to be found in it. Please take a look at www.iberianwildlife.com/teresa-farino.htm for further information. The trip began with an uneventful crossing of the Bay of Biscay before reaching port at Santander. There was a fairly short drive along a dangerous road through the spectacular sheer cliffs of the Hermida Gorge along the River Deva before it opened out to reveal the fantastic mountain scenery of the Picos de Europa. We eventually found our rustic cottage accomodation in the tiny mountain village of Arguebanes close to the main town of Potes. Over the two week period of the holiday we made several trips out along the roads from the town of Potes with the exception of our first day where we walked into the foothills of the mountains from our base, El Empedrado, in Arguebanes. The walk above the village and each of the four main routes out of Potes with stops made along each are described in detail on the DVD, showing the butterflies and other wildlife encountered on these routes. The DVD has been produced in this way to show fellow travellers what can be viewed on each route should time be a limiting factor. Please bear in mind that we followed certain routes two or three times but with favourable weather conditions most of the wildlife described on each route could be encountered on one journey along each. Specialities that we encountered and filmed were high alpine birds such as Alpine Accentor, Alpine Chough, Snowfinch and Wallcreeper. Butterflies that were filmed included: Rosy Grizzled Skipper, Large Chequered Skipper, Apollo, Berger's Clouded Yellow, Spanish Purple Hairstreak, False Ilex Hairstreak, Scarce Copper, Lang's Short-tailed Blue, Geranium Bronze, Dusky Large Blue, Spanish Chalkhill Blue, Gavarnie Blue, Southern White Admiral, Iberian Heath Fritillary, Provencal Fritillary, Meadow Fritillary, Spanish Heath, Spanish Gatekeeper, Dusky Meadow Brown, Western Brassy Ringlet, The endemic Chapman's Ringlet, Iberian Marbled White and Esper's Marbled White plus many more. This production was filmed in broadcast quality digital format using a Canon XL-H1 High Definition video camera. The footage has been captured onto two DVD's showing approximately 130 minutes of high quality uncompressed digital video with complete menu accessed using your DVD players remote. Please take a look at the trailer above. The two discs include a full narrative which is not included on the trailer. Paul, many thanks for prompt sending of DVD. We have both seen them now and were very impressed with both the quality and content. We always look forward to your annual offering, and you did not disappoint this time. Hope you are able to do many more. Please click here to read the review by Peter Eeles and see further video footage from the DVD including narrative. 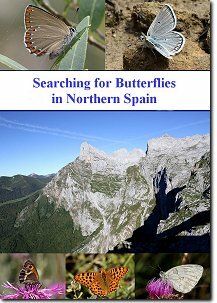 This twin DVD film set "Searching for Butterflies in Northern Spain" is available for purchase from £15.00 including postage and packing. Please select the correct postage option from the drop down menu to ensure delivery.